Just South of Manchaca and South Lamar, EcoClean’s South Austin locations joins Torchy’s and Kerby Lane in the busy Corner’s shopping center. If you are looking for south Austin dry cleaners, look no further! 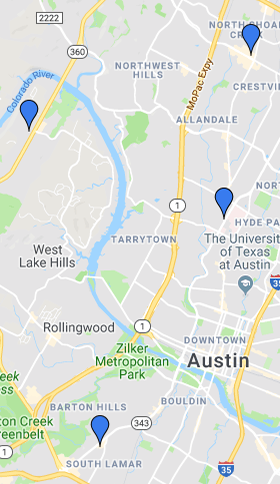 South Austinites have been increasingly asking, “why aren’t there any green cleaners near me?” Ask no more. EcoClean has arrived. BREAKING NEWS: Our South Lamar location is now an Austin Dry Cleaner open on Sundays. We are in the south west corner of the intersection of Loop 360 and Westlake Dr in the San Clemente shopping center. We join Jack Allen Kitchen, The Woodhouse Day Spa and Wild Orchid Salon in this exciting shopping area in Westlake. If you are looking for west Austin dry cleaners, look no further! Residents of Westlake have been asking, “why aren’t there any green dry cleaners near me?” Ask no more. EcoClean has arrived.